Double bed, Wardrobe, Mirrored cabin, Bedside tables with lamps, SAT TV, A/C .Two Single beds, Wardrobe, Mirrored cabin, Bedside tables with lamps, SAT TV, A/C ,Bath, W.C., Wash basin . 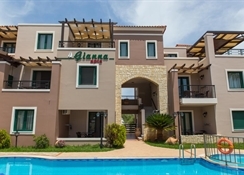 Gianna is a small well designed property of ten apartments located in the centre of Almyrida. 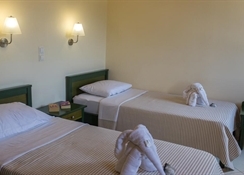 It is complemented with a good size mosaic-tiled pool and separate childrens pool. Views welcome the Lefka Ori, White capped mountains. The excellent design includes a stone arch entrance with a marble staircase leading to the first and second floors. 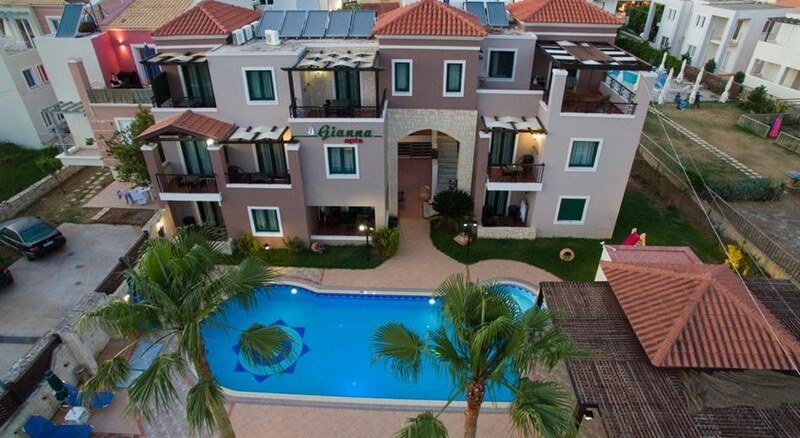 Gianna apartments are perfect for couples and families. Shops, cafes and restaurants are just 100 metres walk away, and so is the beautiful shallow and sandy beach of Almyrida, which is also great for adults and children. Part of this beach is lined with excellent tavernas serving fresh seafood or homemade local food. At one end of the beach is the small fishing harbour, and the other end has a sheltered sandy beach, excellent for snorkelling. Barbeque, Parking, Garden Area, Private pool, Pool bar, Sun beds, Umbrellas, Shower Fridge freezer, 2 ring hob & mini oven, Kettle, Toaster, Safe box, Wi-Fi connection, Iron & board, Dining table & chairs, One single bed, A/C, Patio/Terrace with table & chairs .